Argyle House B & B is situated in the heart of the West Cliff Conservation area of Whitby and is only 200 yrds walk from the town centre shops, habour and beach. This B & B ideal for those wishing to explore this beautiful part of Yorkshire. With it's interesting cobbled streets and original buildings leading up to Whitby Abbey, visitors will find Whitby's historic past enchanting and addictive. The Heartbeat TV series was often filmed at the bottom of the street. Heartbeat was based 6 miles away in the village of Goathland and is a train ride away on the North Yorkshire Moors Railway. The scenic steam train journey is a must for all visitors. Our Bed & Breakfast is ideal for visiting the surrounding areas of Robin Hoods Bay, Goathland (Heartbeat), Grosmont (North Yorkshire Steam Railway), Staithes and The Dalby Forrest (excellent for walking and mountain bike trails). The Clevelend way passes Argyle House making it a perfect stopover for walking. Other specialist events such as Goth weeks, Folk Week, Gospel Weekend, Linedancing weekends, Live Music, Whitby Regatta, Musicport are all based in this popular area. 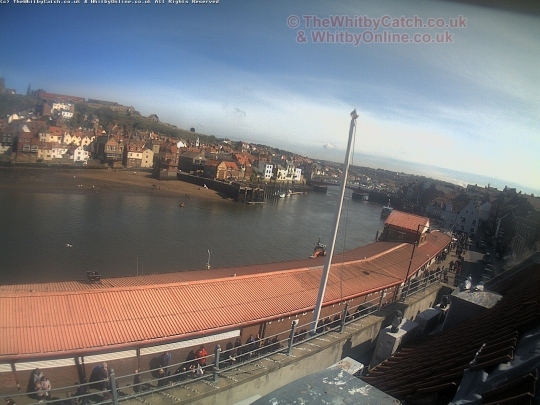 Copyright © Whitby Web Cam - All Rights Reserved. We are listed on Lovetoescape who also have a great range of Holiday Cottages including Self-Catering in The North York Moors and Devon Cottages .